It's just over 63 days until the World Cup kicks off in sunny South Africa and the world is starting to come alive with excitement about Africa's first world cup. People are starting to worry about their favourite players' prospects (don't worry die-hard England fans, I'm sure Beckham will be a spectacular mascot), getting to South Africa, staying in South Africa, getting around in South Africa and the effect the recent murder of Eugene Terreblanche (I hope and doubt very much will come of this), but I wonder how many people are worrying about communicating with the lovely people in South Africa. This new remarkable pocketsize phrasebook is so comprehensive, well-researched and easy-to-use that it should be made mandatory for every South African and visitor to South Africa to have one. Hello South Africa™ translates more than 600 phrases in 30 topics into each of our official languages, making it an essential communication tool to help South Africans – and visitors to the country - converse, on a basic level, with any South African in his/her mother tongue. It holds huge credibility as the translations, pronunciation guides and pseudo-phonetics have been done by top academics in the African Languages Departments of distinguished South African Universities. The book not only helps its readers to communicate in all official languages but it also serves as a full colour souvenir giving insight into the rich linguistic and cultural make-up of South Africa and her people. It boasts fascinating introductions on the history of language in South Africa and on the varied cultures, written by leaders in the fields of Linguistics and Social Anthropology. 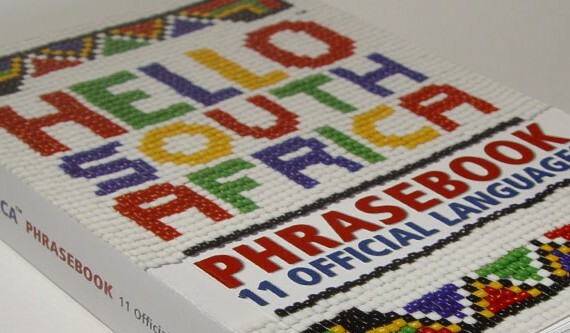 The phrasebook is complete with language distribution maps showing users where the various languages are predominantly spoken, practical travel tips and photographs that celebrate South Africa’s scenic splendour and unique cultural textures. Sounds like a great pocket guide and certainly more interesting than some of those you get for other countries. Sadly, you'll have to pick one up when you get there (Jo'burg and Cape Town Intl airports have Exclusive Books stores) as Amazon don't appear to be selling this (not really surprising) and it would cost you more than the book in P&P to get this sent to you from one of South Africa's online retailers. Oh, and to help you out when you first arrive and walk off the plane (before you've had a chance to locate the book shoppe): Sawubona and Ngiyabonga (Zulu for Hello and thank-you respectively) would be a perfect way to start your trip off. You may also find this guide useful in understanding some of the words used in English conversation.